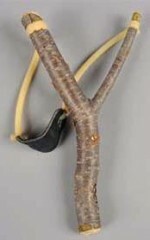 The slingshot, pictured above, is the chosen weapon of Bart Simpson, David of “David and Goliath” fame, and Michael Poret, Beverly Hills investment broker turned unlikely vandal. District Attorney’s Office announced on Thursday, September 20. Michael Steven Poret was notified to appear for arraignment on September 28 in Beverly Hills Superior Court, Department 1, said Deputy District Attorney Annemarie Acosta, who filed the case on Tuesday. The Encino resident is charged with 12 total counts, including six felony counts of vandalism over $400 in damage between Jan. 27 and July 3, five counts of possession of an array of weapons and one felony count of possession of a controlled substance, methamphetamine. Poret, who works for an investment bank in Beverly Hills, was first arrested July 3 by Beverly Hills police officers after he allegedly vandalized a home for the second time. He was arrested again on July 12 by LAPD officers, Acosta said. He is suspected of using a sling shot to fire metal projectiles through dozens of windows in Beverly Hills and the San Fernando Valley, causing damage estimated between $65,000 to more than $125,000. Prosecutors will ask that his bail be set at $360,000 when he is arraigned. If convicted, he faces up to 10 years, eight months to be served in county jail.